gFraunhofer MEVIS, Institute for Medical Image Computing (F.W., H.K.H. ), Bremen, Germany. BACKGROUND AND PURPOSE: Spinal cord atrophy is a common and clinically relevant characteristic in multiple sclerosis. We aimed to perform a multicenter validation study of mean upper cervical cord area measurements in patients with multiple sclerosis and healthy controls from head MR images and to explore the effect of gadolinium administration on mean upper cervical cord area measurements. MATERIALS AND METHODS: We recruited 97 subjects from 3 centers, including 60 patients with multiple sclerosis of different disease types and 37 healthy controls. Both cervical cord and head 3D T1-weighted images were acquired. In 11 additional patients from 1 center, head images before and after gadolinium administration and cervical cord images after gadolinium administration were acquired. The mean upper cervical cord area was compared between cervical cord and head images by using intraclass correlation coefficients (ICC) for both consistency (ICCconsist) and absolute (ICCabs) agreement. RESULTS: There was excellent agreement of mean upper cervical cord area measurements from head and cervical cord images in the entire group (ICCabs = 0.987) and across centers and disease subtypes. The mean absolute difference between the mean upper cervical cord area measured from head and cervical cord images was 2 mm2 (2.3%). Additionally, excellent agreement was found between the mean upper cervical cord area measured from head images with and without gadolinium administration (ICCabs = 0.991) and between the cervical cord and head images with gadolinium administration (ICCabs = 0.992). CONCLUSIONS: Excellent agreement between mean upper cervical cord area measurements on head and cervical cord images was observed in this multicenter study, implying that upper cervical cord atrophy can be reliably measured from head images. Postgadolinium head or cervical cord images may also be suitable for measuring mean upper cervical cord area. Mean upper cervical cord area (MUCCA) can be measured by using 3D T1-weighted MR images of the cervical cord.3,4 The MUCCA also has been measured recently on 3D T1-weighted MR images of the head covering the upper cervical cord, which has yielded promising results showing associations between MUCCA and clinical disability and disease progression.2,5 Measuring the MUCCA from head MR images offers the opportunity to analyze MUCCA retrospectively in datasets without dedicated cervical 3D T1-weighted images, and it can reduce costs and patient burden in prospective studies by eliminating the need for separate cervical cord image acquisitions if these are only acquired to measure the MUCCA. An MR imaging contrast agent is commonly used to detect the blood-brain barrier breakdown and inflammation in new lesions12,13 in patients with MS, which might influence the MUCCA measurements by tissue-contrast changes. The effect of the MR imaging contrast agent on MUCCA measurement also has to be investigated to ease the implementation of MUCCA as an auxiliary measurement in clinical practice. Although MUCCA measurements based on head 3D T1-weighted images have been successfully used in a monocenter study,14 multicenter validation is lacking. In addition, the possible effect of intravenous contrast administration on MUCCA measurements has not been investigated. 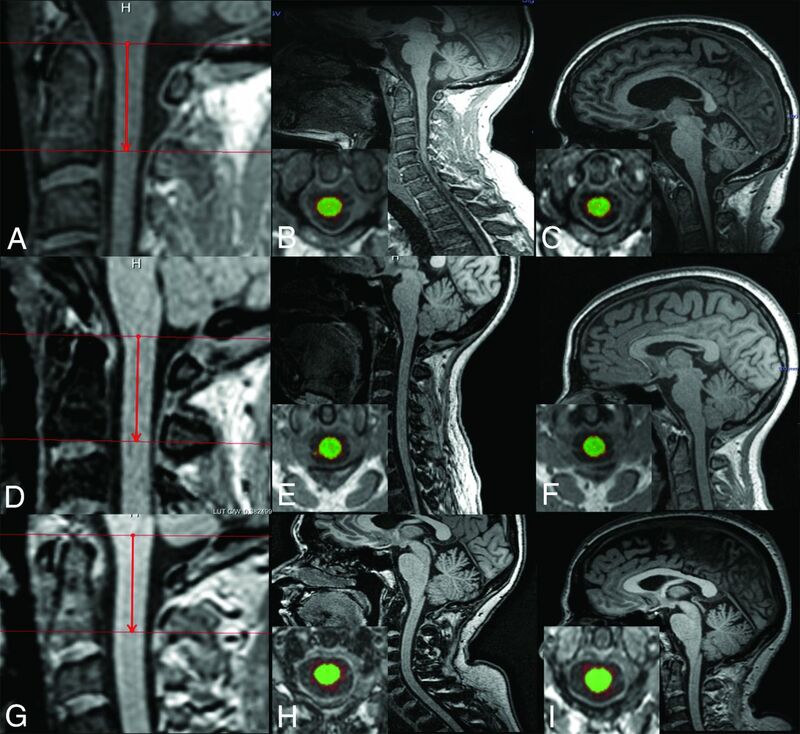 Therefore, the aim of the current study was to validate the measurement of the MUCCA on the basis of head compared with cervical cord 3D T1-weighted images in patients with MS and healthy controls on different MR imaging systems by using different acquisition parameters from multiple centers and to explore the effect of gadolinium (Gd) administration on MUCCA measurements. The study was approved by the local institutional review board of the 3 centers (Amsterdam, Beijing and Bochum), and informed consent was obtained from each participant. To investigate the variability of the MUCCA based on head 3D T1 MR images and cervical cord 3D T1 MR images, we selected scans from ongoing local cohorts in which separate head and cervical cord 3D T1 MR images were acquired. All images were checked for visibility of the spinal cord without artifacts, and head images were checked for coverage of the upper cervical cord. A total of 97 subjects were recruited from 3 centers (A: Amsterdam, B: Beijing, and C: Bochum), including 40 patients with relapsing-remitting MS (RRMS), 10 with primary-progressive MS (PPMS), 10 with secondary-progressive MS (SPMS), and 37 HCs. The subjects from the Amsterdam center were selected from a larger cohort (most data from this cohort have been published before3) in a semirandom fashion, to include 20 with RRMS, 10 with SPMS, 10 with PPMS, and 20 HCs. We ensured that the selected subsets spanned the range of spinal cord area of the total group (on the basis of the previously published measurements from cervical images3). MS diagnosis was determined according to the 2010 revisions of the McDonald criteria.15 The main demographic and clinical characteristics included the Expanded Disability Status Scale (EDSS)16 scores and disease duration of the participants. To explore the effect of intravenous Gd administration on MUCCA measurements, we included an additional 11 patients from Center C, including 2 with clinically isolated syndrome suggestive of MS and 9 with RRMS. In these patients, head images before and after Gd administration and cervical cord images after Gd administration were acquired. In all 3 centers, a 3T MR imaging system was used to acquire high-resolution 3D sagittal T1-weighted head (with head coils) and cervical cord (with spine coils) images in the same scanning session. Corrections for geometric distortion due to gradient nonlinearity were applied in 3D. Details of MR imaging systems and acquisition parameters are provided in Table 1. Examples of images from each center (cervical cord and head images). Sagittal T1-weighted MR image of the ROI selection (30-mm section length) in the upper cervical cord, starting at the upper borders of vertebral level C2 (A, D, and G), and sagittal images of the cervical cord and head with representative axial reformats overlaid by corresponding segmentation images from a patient with SPMS from Center A: B, MUCCA cervical cord images = 62 mm2, C, MUCCA head images = 64 mm2. A patient with RRMS from Center B: E, MUCCA cervical cord images = 74 mm2; F, MUCCA head images = 75 mm2. An HC subject from Center C: H, MUCCA cervical cord images = 82 mm2; I, MUCCA head images = 80 mm2. Analyses were performed by using SPSS software (Version 18; IBM, Armonk, New York). Kolmogorov-Smirnov tests were performed together with visual inspection of histograms to assess the normality of the variables. Comparison of the demographic data and MR imaging parameters between different disease subtypes and HCs or among different centers was conducted by using ANOVA, with Bonferroni correction for post hoc comparisons. The intraclass correlation coefficients (ICCs) were calculated to assess both absolute agreement (ICCabs) and consistency (ICCconsist) between MUCCA measurements from head and cervical cord images. These calculations were also performed separately for each center and each disease subtype. The difference between MUCCA measurements on head and cervical cord images was calculated in square millimeters and as percentages. For the exploratory analysis of the effects of intravenous Gd administration, the above-mentioned analyses were additionally performed in patients with MS from Center C included in that part of our study. Five subjects were excluded from the final analysis, including 2 HCs from Center A (1 head scan and 1 cervical cord scan with artifacts) and 1 with RRMS, 1 HC from Center B (head scan with artifacts), and 1 patient with RRMS from Center C (the head scan without Gd administration did not cover the upper cervical cord). Finally, 103 subjects were left for final analysis, including 93 subjects without Gd administration from 3 centers (Table 2) and 10 patients with images before and after Gd administration from Center C. As shown in Table 2 and in line with the recruitment of long-standing patients with MS and matched healthy controls in Center A,3 the age of the subjects (including patients and HCs) was older in Center A than in the other 2 centers, and patients from center A had a longer average disease duration and higher EDSS scores than patients from Center B.
MUCCA measured from cervical cord images did not differ among centers in HCs (Center A: 81 ± 9 mm2, Center B: 80 ± 6 mm2, Center C: 84 ± 10 mm2, F = 0.51, P = .61). For the whole cohort, the MUCCA measured from cervical cord images in patients with MS was significantly lower than that in HCs (P < .001). Specifically, in patients with SPMS (P = .02) and PPMS (P < .001), the MUCCA was significantly smaller compared with HCs, and patients with PPMS showed smaller MUCCAs than those with RRMS (P = .01), whereas the MUCCA did not differ between patients with RRMS and HCs (P = .20) or between those with SPMS and those with RRMS (P = .63). MUCCA measured from head images showed similar group effects across centers and groups, including differences between those with MS and HCs, as well as among disease subtypes. There was excellent absolute and consistency agreement of MUCCA measurements from head and cervical cord images in the whole group (ICCabs = 0.987, ICCconsist = 0.987). Similarly, strong ICCs were observed across different centers and disease subtypes (On-line Table). The mean difference between MUCCA measured from head images and cervical cord images was 0.1 mm2 (0.1%), ranging from −5 mm2 (−6.1%) to 5 mm2 (6.6%). The mean absolute difference was 2 mm2 (2.3%), ranging from 0 to 5 mm2 (6.6%) (On-line Table). For illustration purposes, scatterplots (Fig 2) and Bland-Altman plots (Fig 3) were created, which provide information on the interchangeability of the 2 measurements, by using MUCCAs from cervical cord images as the criterion standard. 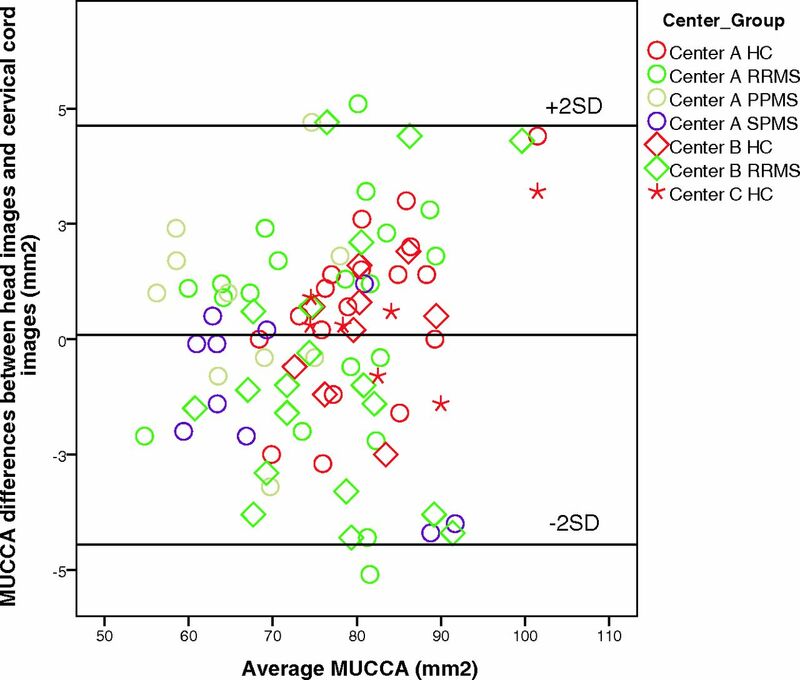 Scatterplot of the MUCCA measured from head-versus-cervical cord images. Different shapes indicate different centers (circle: Center A; diamond: Center B; star: Center C), and different colors represent different subgroups of subjects (red: HC; green: RRMS; yellow: PPMS; purple: SPMS). The solid black line indicates perfect agreement. Bland-Altman plots for MUCCA measurements from cervical cord images and head images. The averages of MUCCA measurements on cervical cord and head images are shown on the horizontal axis, and the differences in MUCCA between the 2 measurements are shown on the vertical axis. Different shapes indicate different centers (circle: Center A; diamond: Center B; star: Center C), and different colors represent different subgroups of subjects (red: HC; green: RRMS; yellow: PPMS; purple: SPMS). Table 3 presents the results of the comparisons between MUCCA measurements based on 3D T1 MR images with and without Gd administration. Excellent agreement was found between MUCCA measurements on head images with and without Gd administration (ICCabs = 0.991, ICCconsist = 0.990) and between MUCCA measurements on cervical cord images and head images with Gd enhancement (ICCabs = 0.992, ICCconsist = 0.992). The results of the current study demonstrate that MUCCA can be reliably measured by using head images covering the upper cervical cord in a multicenter setting across MS subtypes. Furthermore, our data suggest that Gd enhancement does not have a substantial influence on MUCCA measurements. Gd administration is often included in routine MR imaging protocols of patients with MS20 and can change the contrast of brain and spinal cord images. The question of whether the MUCCA can be reliably measured on images obtained after Gd administration is therefore clinically relevant, but it has not been investigated before, to our knowledge. In the current study, we were unable to perform a rigorous assessment with available data for only 10 patients from a single center. However, these preliminary results showed excellent agreement of the MUCCA between head images with or without Gd administration and between head and cervical cord images with Gd administration, suggesting that Gd administration has little effect on MUCCA measurement. These results should be confirmed in a larger group of patients and a multiscanner setting. If future studies confirm the current finding, one could use head images or cervical cord images after Gd administration to measure MUCCA, which would present another option to assess cervical cord atrophy. However, care should be taken in case of enhancing intramedullary cervical cord lesions that may affect MUCCA estimation on images obtained after Gd administration. Because in the present study no enhancing lesions were observed on the postcontrast images, we cannot exclude a bias in such cases. Furthermore, enhanced spinal nerves after Gd administration may influence the segmentation of the cord, another potential factor influencing MUCCA measurement. Although this study included only 3 centers, the 3 main MR imaging vendors and the most commonly used sequences for high-resolution cervical cord and head imaging were included. Despite the (subtle) differences in tissue contrast among different scanners and 3D T1 sequences, agreement was excellent, suggesting the generalizability of our results beyond scanners and pulse sequences. Therefore the MUCCA has the potential to become a viable marker for MS in a routine clinical setting and clinical treatment trials. Several limitations apply to this work. First, we did not normalize the MUCCA measurements for intracranial volume, body height, or other parameters because optimal parameters for cervical cord volume or area normalization remain controversial.21⇓–23 Second, the presence of cord lesions including T2 hyperintensity and T1 hypointensity in the measurement area may influence MUCCA measurements due to underestimation of white matter volumes owing to lesion misclassification.9 However, the lesions are present on both cervical cord and head images, which may cause a similar effect on MUCCA measurements. The high ICC values in all subgroups suggest that if an effect is present, it is comparable between both image types. Third, HCs were younger than those with MS, especially those with SPMS and PPMS in Center A in the current study. 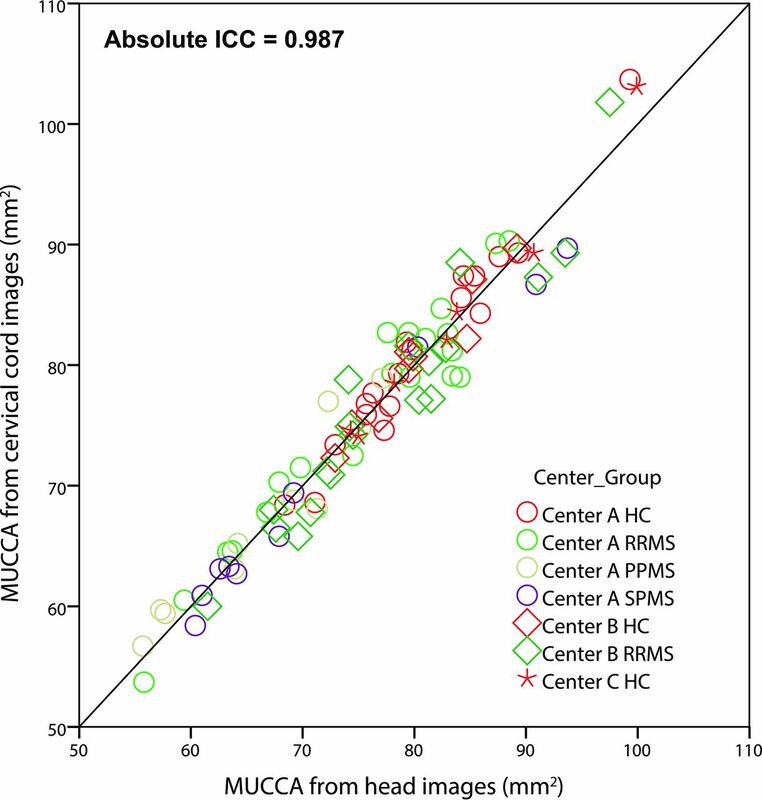 High ICC values were identified in HCs and all MS subgroups, suggesting that age has little influence on the consistency of measurements of the MUCCA between cervical cord and head images. Finally, this is a cross-sectional study; a longitudinal study is warranted to extrapolate the current findings to MUCCA changes with time. Excellent agreement between MUCCA measurements from cervical cord and head images was observed across centers and disease subtypes in a multicenter setting, implying that upper cervical cord atrophy can be reliably measured by using head images covering the upper cervical cord. If there are no enhancing cervical cord lesions, postcontrast 3D T1-weighted images of the cervical cord or head may also be a suitable source for measuring MUCCA. These findings have important implications for clinical studies, including treatment trials. Disclosures: Carsten Lukas—UNRELATED: Biogen Idec, Bayer Schering, Novartis, Sanofi, Genzyme, and Teva; Employment: endowed professorship supported by the Novartis Foundation*; Grants/Grants Pending: Bayer Schering, Teva, and Merck Serono*; Payment for Lectures (including service on Speakers Bureaus): Biogen Idec, Bayer Schering, Novartis, Sanofi, Genzyme, and Teva; Travel/Accommodations/Meeting Expenses Unrelated to Activities Listed: Bayer Schering; OTHER: Dr Carsten Lukas received consulting and speaker's honoraria from Biogen Idec, Bayer Schering, Novartis, Sanofi, Genzyme, and Teva and a research scientific grant support from Bayer Schering, Teva, and Merck Serono. He holds an endowed professorship supported by the Novartis Foundation. Martin D. Steenwijk—RELATED: Grant: Dutch MS Research Foundation (grant No. 09–358d). * Marita Daams—RELATED: Grant: Dutch MS Research Foundation (grant No. 09–358d),* Comments: private sponsorship to the VUmc Center Amsterdam which is sponsored through a program grant by the Dutch MS Research Foundation (grant No. 09–358d). Mike P. Wattjes—UNRELATED: Consultancy: Roche,* Novartis*; Payment for Lectures (including service on Speakers Bureaus): Biogen; Royalties: Springer; OTHER: Dr Mike P. Wattjes serves as a consultant for Biogen Idec and Roche. Frederik Barkhof—RELATED: Grant: Dutch MS Research Foundation*; UNRELATED: Consultancy: Synthon, Teva, Roche, Biogen Idec, Novartis; OTHER: Dr Frederik Barkhof serves as a consultant for Bayer Schering Pharma, Sanofi-Aventis, Biogen Idec, Teva, Merck Serono, Novartis, Roche, Synthon, and Jansen Research. Hugo Vrenken—UNRELATED: European Committee for Treatment and Research in Multiple Sclerosis/Magnetic Research Imaging in Multiple Sclerosis, Merck Serono, Novartis, Teva; Dutch MS Research Foundation, Comments: Dr Yaou Liu and I obtained a European Committee for Treatment and Research in Multiple Sclerosis application, and I was designated as the supervisor. The work described in the current article was performed during the time he was at our institution and employed through this fellowship; research grant for multiple sclerosis brain imaging; pending research grant for multiple sclerosis brain imaging; research grants for multiple sclerosis brain imaging; OTHER: Dr Hugo Vrenken has received research funding from Novartis, Pfizer, and Merck Serono and speaker honoraria from Novartis. * *Money paid to the institution. This work was supported by the European Committee for Treatment and Research in Multiple Sclerosis/Magnetic Research Imaging in Multiple Sclerosis Fellowship from the European Committee for Treatment and Research in Multiple Sclerosis (Y.L), the National Science Foundation of China (No. 81101038 and 81501736), Beijing Municipal Administration of Hospitals Clinical Medicine Development of Special Funding Support (No. ZYLX201609), the Beijing Natural Science fund (No. 7133244), the Beijing Nova Programme (No. xx2013045), and the Key Projects in the National Science & Technology Pillar Program during the Twelfth Five-Year Plan Period (No. 2012BAI10B04). Part of this work was supported by the German Federal Ministry for Education and Research, Bundesministerium für Bildung und Forschung, and the German Competence Network Multiple Sclerosis (Kompetenznetz Multiple Sklerose) (No. 01GI0914). The VUmc MS Center Amsterdam is sponsored through the program grant by the Dutch MS Research Foundation (Nos. 09-358d and 14-358e). Accepted after revision August 27, 2015. Spinal cord atrophy rates: Ready for prime time in multiple sclerosis clinical trials?